Visit the Semantically Enhanced Journal Portal (SEJP). The Semantic Web journal relies on an open and transparent review process. Also of interest: the Studies on the Semantic Web book series. 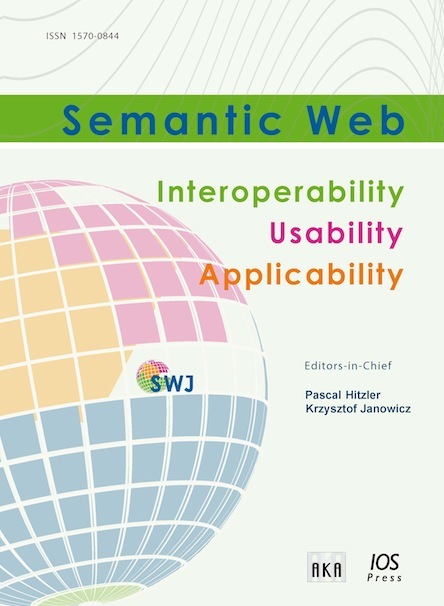 The journal Semantic Web – Interoperability, Usability, Applicability is an international and interdisciplinary journal bringing together researchers from various fields which share the vision and need for more effective and meaningful ways to share information across agents and services on the future Internet and elsewhere. As such, Semantic Web technologies shall support the seamless integration of data, on-the-fly composition and interoperation of Web services, as well as more intuitive search engines. The semantics – or meaning – of information, however, cannot be defined without a context, which makes personalization, trust and provenance core topics for Semantic Web research. New retrieval paradigms, user interfaces and visualization techniques have to unleash the power of the Semantic Web and at the same time hide its complexity from the user. Based on this vision, the journal welcomes contributions ranging from theoretical and foundational research over methods and tools to descriptions of concrete ontologies and applications in all areas. Papers which add a social, spatial and temporal dimension to Semantic Web research, as well as application-oriented papers making use of formal semantics, are especially welcome. The journal is co-published by the Akademische Verlagsgesellschaft AKA. See detailed instructions to authors here: http://www.semantic-web-journal.net/authors. Please take a moment to read IOS Press' general publication ethics guideline before submitting your manuscript. When preparing a paper for submission to SWJ in LaTeX you can use our LaTeX template.